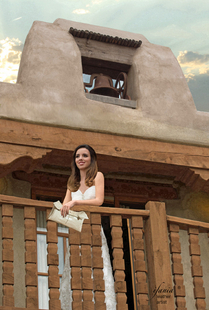 Patents pending and various copyrights on the handbags and accessories, designs, patinas and colors. 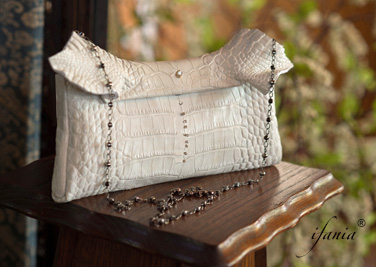 Luxurious clutch made with supple white alligator and rich lambskin interior. Paired with a 1/3 carat diamond stud in 14K gold & sprinkled with smaller diamond studs. Other colors available upon request. Comes with detachable chain. 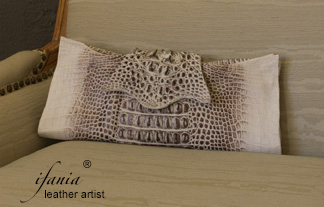 White & chocolate brown clutch. 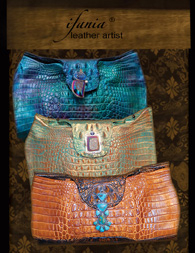 Handcrafted with Hornack Alligator inside & out. Butterfly style unfolds to lay flat revealing slots for cards & ID. Two leather lined pockets hold cell phone, make-up & other essentials. Comes with two removable straps - one leather & one chain. Measures approx. 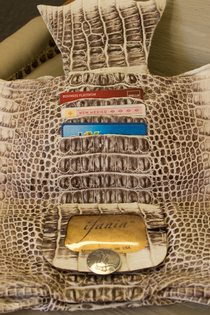 12 X 5"
Pecan and black walnut Nile Crocodile clutch. Paired with flower-shaped sterling silver & turquoise jewel. Butterfly style unfolds to lay flat revealing slots for cards & ID. Two leather-lined pockets hold make-up, cell phone and other essentials. Comes with removable leather strap. Measures Approx. 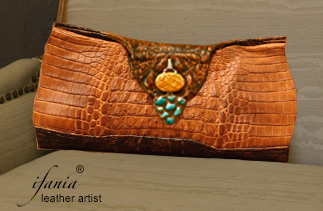 10-11 X 8"
Pecan and black walnut Nile Crocodile clutch. Paired with spiny oyster and blue turquoise jewel in sterling silver. Butterfly style unfolds to lay flat revealing slots for cards and ID. Two leather-lined pockets hold make-up, cell phone and other essentials. Comes with removable leather strap. Measures approx. 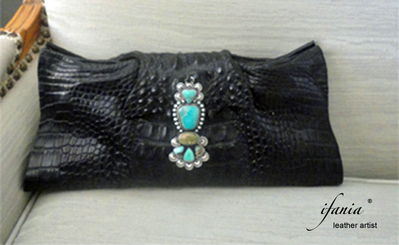 10-11" X 8"
Exquisite black Hornback Alligator clutch. Coupled with pecan & brown matrix turquoise cabochons jewel in sterling silver. Butterfly style unfolds to lay flat revealing slots for cards & ID. Two leather-lined pockets hold make-up, cell phone and other essentials. Comes with two removable straps - one leather and one chain. Approx. 12 X 5"
Copyrighted 2011. Imaginations Flying, LLC. All Rights Reserved.